I’ve been growing vegetables, fruit and herbs for years and I have to say, I learn something new every season. Just when I think I’ve mastered the art of growing beets, I get a crop of teeny tiny ones for reasons I don’t understand. Sometimes the potatoes I plant don’t produce well, and then there are the years when the carrots just don’t grow or the squash just dies on the vine. While I feel pretty confident in my ability to grow non-edible plants, I still struggle to turn out consistently usable food crops. I’m probably doing all sorts of things wrong, but I’d also like to blame some of the problem on our weather. It’s not easy to grow edibles in cold climates. So when I was asked to review John Whitman’s new book Fresh from the Garden: An Organic Guide to Growing Vegetables, Berries, and Herbs in Cold Climates, I jumped at the chance. 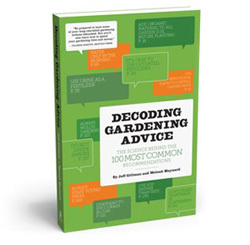 Published by the University of Minnesota Press earlier this year, Whitman’s book offers more than 500 pages of color photos and helpful, practical information, starting with easy-to-understand organic gardening basics and expanding into specifics on how to grow, harvest and store a wide range of edibles. Unlike some gardening books where you can tell the writer has never touched a trowel, Fresh from the Garden offers know-how and advice that reflects Whitman’s 50-plus years of gardening experience. He is also the author of several other books that I use and trust, including three in the cold climate gardening series: Growing Perennials in Cold Climates, Growing Shrubs and Small Trees in Cold Climates and Growing Roses in Cold Climates. One of the things I like most about Whitman’s approach is the way he just says what he thinks, citing his own experience rather than repeating things that are commonly said like—you MUST get a soil test before planting. “I consider its value questionable for most home gardeners but worth the cost for mini-farmers,” he writes, explaining that he’s never done a soil test in 60 years of gardening. I’ve gone back and forth about soil tests over the years and concluded that most gardeners I know, including master gardeners, don’t test their soil’s nutrient and pH levels regularly if at all. That said, soil tests are useful if you’re having problems growing something or you want to grow something with specific needs, like blueberries, which require more acidic soil. Soil tests are also necessary, he writes, and I would agree, if heavy metal contamination, particularly lead, could be a an issue where you are planting. At this point in the season, tomatoes are either doing great or tipping toward disaster. So in addition to offering some growing tips to help make tomatoes happy and healthy, I’ll explain some of the common things that can go wrong. Probably the most important thing you need when growing tomatoes is sunlight—8 hours or more is best, but 6 will allow plants to produce a fair amount of fruit. If you don’t have a spot that gets even 6 hours of sun and someone is home a lot during the day, consider buying a few round, rolling plant stands. I got mine (which look like metal Frisbees on wheels) at Ikea, but most garden centers sell them now, too. Put your tomatoes in large pots, set them on the rolling plant stands and move them into the sun as it moves throughout the day. Soil is key to tomato success too. They thrive in healthy soil, so it’s a good idea to work some compost and composted manure into the area before planting. If you’re planting in pots, just add those things into your potting mix. Halfway through the season, scratch a little more compost into the top of the soil around plants, but don’t add more manure. Too much nitrogen (N) will give you lots of leaves and little fruit. You want a fertilizer with more potassium (K) than nitrogen in it. Phosphorous (P) can also be on the low side, usually, since compost supplies a good amount of that. Product labels always show the N-P-K ratio like this: 10-10-10 or 5-2-1. You want something more like: 1-0-4 or 1-1-3. Seaweed (powdered or liquid kelp) is a great choice and is usually 1-0-4. Tomatoes like water, but not too much. Water plants deeply but not so often, or so much, that you end up with soggy soil. That can lead to disease problems and, later in the season, to tomatoes that don’t taste like much because all that water got channeled into the plant’s fruit. If you’re growing tomatoes in pots, stop watering when you see water running out of the bottom of the pot. Watering consistently, every few days in hot weather—more often if plants are growing in pots—will also help prevent the dreaded blossom end rot. You know you have this common problem when your tomatoes have black spots on their bottoms. Consistent watering allows the fruits to get the calcium they need from the soil to develop properly. Did you bury the stem at planting time? If not, do that next year by gently plucking off the plant’s branches below the top flush of leaves. Depending on the size of your transplant, you’re usually burying 2 to 6 inches of stem, and that’s a good thing because new roots will sprout all along that stem and help your tomatoes be strong and healthy. Pruning tomatoes doesn’t need to be as complicated as it is often described. Tomatoes are classified by growth habit: determinate tomatoes—also called bush tomatoes—are bred to be more compact, usually about 4 feet tall while indeterminate varieties—also known as climbing or vining types—can grow to 6 feet tall or more. Determinate tomatoes don’t need much pruning beyond removing all of the suckers below the first flower cluster. Indeterminate tomatoes benefit from some pruning, but you don’t need to grow crazy. Basically, if you pinch out suckers and pare plants down to around stems, you’ll get bigger fruit and less sprawling growth. If you let plants be more unruly than that, you’ll get more fruit but you’ll have to deal with a more tangled mess of vines. Either way if fine, so don’t sweat it a whole bunch. Are the leaves on your tomato plants curling up in hot weather? Don’t worry, that’s probably not a disease. It’s just how some tomato varieties react to the heat. This type of leaf roll usually starts on lower leaves and works its way up. It doesn’t look great, but it shouldn’t affect fruit development. Watering regularly and mulching the ground beneath your tomatoes can help keep this problem at bay. Well gardener friends, at this dark time when we are up to our eyeballs in bad news about pretty much everything and politicians are compounding our worries by behaving like raised-by-wolves toddlers, let me offer a spot of sunshine. In case you haven’t heard, two positive things have happened for the planet—or at least our local slice of it—in recent weeks. Good thing number 1: At long last, the Minnesota Department of Agriculture has confirmed that neonicotinoids, a commonly used group of pesticides, are highly toxic to honeybees—even when they are used in accordance with the law. How is this good news? You ask. Well, despite mounting evidence, the suggestion that neonics are likely one of many things contributing to the decline of honeybees remains heatedly disputed. Now, investigators from the state Department of Agriculture have found that in fact the hives of two beekeepers were decimated by toxic dust that drifted from the cornfield of a neighbor. The seeds the neighbor planted had been coated with clothianidin, a neonicotinoid that is routinely used to coat agriculturally grown corn and soybeans in the United States. The insecticide protects the seeds from insects in the soil. It also protects the plants themselves because all parts contain the toxin, making the whole corn or soybean plant poisonous. According to a Star Tribune story on March 20, Bayer CropScience, the maker of neonic pesticides, has acknowledged that toxic drift from cornfields planted with treated seeds can be harmful to bees and other pollinators. However, they say the problem is rare. Beekeepers and bee researchers beg to differ, countering that drift is a common and ongoing issue. Both beekeepers will be compensated for the loss of their hives under a 2014 law that enables beekeepers to collect damages even though, technically, no law was broken because seed treating is not currently considered a pesticide application. What? Anyway, yes there is much to be done on this issue, but the Department of Agriculture’s action makes Minnesota the first state to declare, as a finding of fact, that neonics are harmful to bees. Fellow gardeners, the seeds available to us are not coated with neonics, but we can continue to do out part to help bees and the Earth by saying NO to plants that are sprayed and/or soil-drenched with the neonicotinoid pesticides. Ask before you buy. Together we can make a change. On March 16, the Minneapolis Park and Recreation Board (MPRB) voted to stop using glyphosate (the active ingredient in the weed killer, Roundup) in neighborhood parks. Activists have been calling on the park board to ban chemical use in Minneapolis parks for several months. (See the Southwest Journal story I wrote on the issue in October for more information.) Little progress has been made so far. But during a park board meeting on the 16th, more than 40 people showed up to voice their opposition to the use of pesticides, herbicides and other chemicals in public parks. Many others called and emailed. This public outpouring of concern about the health effects of glyphosate and other chemicals, in addition to a recent update board members received on when and where staff use chemicals, seems to have sparked the move to stop using Roundup. But eliminating the use of one chemical in neighborhood parks is a long way from the shift to chemical-free, organic park management that activists would like to see. In the absence of glyphosate, which has been increasingly linked to health and environmental problems, the board is free to continue using many other pesticides and herbicides that could potentially cause harm. The vote also allows them to continue using Roundup in regional parks at Lake Calhoun and Minnehaha Falls, as well as on ball fields and golf courses. Based on what has been said about the issue, only commissioner Brad Bourn is openly in favor of moving to an organic approach to managing Minneapolis parks. Commissioner John Erwin strongly supports reducing the use of chemicals. The rest of the board—all of them elected by the public—don’t seem to see chemical-free parks in our future. Do you? If so, now is the time to email the commissioners, particularly Scott Vreeland, who has repeatedly said this is an issue that only activists care about. From what I hear from neighbors and readers who frequent our parks with their children and dogs, I am certain he is mistaken. Of all the things in our landscape, I think the galvanized cattle troughs (also known as stock tanks) in our backyard get the most attention. Even in the winter when nothing is growing in them, their shapes and sheer size turn heads and provoke questions. We added them to what we’re now calling “our little farm” a couple of years back when we lost a huge oak, and I figured I’d take advantage of the sun to grow some vegetables. After starting with one trough, we added another last year and we’ll be getting one more in the next few weeks. If you want to grow some food on a small, urban lot, you can’t beat these troughs for being easy to get going. You don’t have to build anything, and you don’t have to deal with turning depleted urban soil into something safe, nutrient-rich and workable enough to grow food in. They’re also affordable, durable and tall enough to be out of the way of hungry critters and peeing dogs. People ask all the time where we got the troughs and how to turn one into a raised bed garden, so even though I wrote briefly about this a couple of years ago, I thought I’d explain the process more in-depth here since it’s the perfect time to get raised beds going for the season. Let’s start with where to buy them. Unless you are literally made of money, do not go to a boutique garden center for a livestock trough. You want to go where farmers buy stuff—Tractor Supply Co. and Fleet Farm. If you want to grow things like tomatoes, peppers, beans and squash, get yourself a large trough. One of ours is four feet long and the other is six feet. Both are 2 feet wide and 2 feet deep, and they cost about $80 and $110, respectively. Aside from getting the things home in the back of the car, the biggest job is drilling holes in the bottom for drainage. Use a bit that can drill through metal that’s about the size of a dime of nickel. We drilled holes every few inches all around the outside edge along the bottom, and then added many more holes going across the bottom of the trough from end to end and side to side. Remove the drain plug, too, since you won’t be needing it. Once you’ve got your holes drilled, flip the trough over and put it wherever you want it because once you fill it with soil, you won’t be able to move it around without taking most of that soil back out. We don’t like things looking all kittywampus so we used a level to make sure the trough was lined up properly once we got it situated. (You don’t have to do that unless you’re bugged by such things.) Now comes the soil part. My advice—don’t cut corners. Good soil makes all the difference when you’re growing anything. Because these are containers, albeit huge ones, you want a mix that’s going to drain well. You also want to provide plants with some nutrients that you’ll boost over time by adding compost and fertilizer. You’ll save some money if you make your own mix by combining 1 part topsoil, 1 part compost and 1 part coconut coir or coarse sand (also known as builder’s sand). I’ve done this by combining these things in batches in a wheelbarrow and it worked well. But I’ll admit, it’s a heck of a lot less work to call someone and have a quality potting mix delivered to your driveway. That way, you can just shovel it into a wheelbarrow and take it right over to your trough and other containers. What do I mean by a quality mix? As I’ve said in the past, I’ve learned a lot about soil and compost over the last few years and I’m now opting to go with products that are organic or at least produced by a company or farmer who is willing to explain their process so I can make an informed decision about whether to use it. (For much more on that topic, see my blog post on safe compost. Local organic growers give products from Purple Cow Organics, COWSMO and Mississippi Topsoil high marks. Other local sources that come highly recommended are Kern Landscape Resources and Kelley and Kelley Nursery. Compost from our Linden Hills organics recycling program is also pretty good. But because it includes packaging, paper and other odd bits, I don’t use it to grow edibles. That’s just me. Keep in mind that even though it’s costly to fill your trough with quality potting mix the first year, in subsequent years (unless you get some dreaded disease like early blight of tomatoes) you’ll only need to add a bit more compost to keep soil healthy. If you feel like you’re having drainage issues, add more coir or sand. With the hard part behind you—all you have to do is keep growing. I’ve been wondering that same thing, I told her, explaining that I’ve been researching the topic so I have some answers, but many more questions, too. This prompted more people to weigh in on the subject, asking: Was it important to use organic compost, especially when growing edibles? How do you know that even organic compost is safe? Does composted manure from conventional farmers contain pesticide and herbicide residue that could cause problems in their gardens? Should you have compost tested to find out what’s in it before you use it on food crops and, if so, where? And what about GMOs? Is it safe to use composted manure produced on conventional farms on which cows eat things like Monsanto’s genetically modified Roundup Ready corn and alfalfa? Complex questions like these are difficult to answer definitively for a lot of reasons. Sometimes, there aren’t many studies, if any, on a particular topic. Or maybe there are numerous seemingly reputable studies, but many of them conflict with one another. For example, as a journalist who interviews people for a living, I can tell you that for every scientist I’ve talked to who dismisses the French study that came out last year linking a genetically-modified strain of maize to huge tumors in rats, I’ve got another scientist saying the study should be given serious consideration. Most every commercial potting mix contains sphagnum peat moss because it’s a good, lightweight, organic amendment that improves drainage, as well as water retention and air circulation. The downside to peat moss is that it isn’t a sustainable resource. Peat moss is the decomposing remains of living sphagnum moss, and it is harvested at unsustainable rates from bogs in a manner than involves scraping off the top layer of the living moss to get to the saleable product below. This process destroys centuries-old bogs, doing away with wildlife habitat, releasing C02 into the air, and eliminating wetlands that help prevent flooding. Because of this, conservationists and scientists all over the world have been pushing for limits and even bans on peat moss harvesting. I grow all of my veggies and ornamentals without using peat moss. In Britain, for example, where peat is often burned for fuel, harvesting has become so intense that the government has set goals for phasing out peat for home gardening use by 2020. Professional growers will need to go peat free by 2030. For more information, check out the Royal Horticulture Society’s website: http://www.rhs.org.uk/Gardening/Sustainable-gardening/Peat-and-the-environment/More-about-peat. Most of the peat used by the horticultural industry in the U.S. comes from Canada where talk of limits and bans is also heating up. So, whether you are concerned about the sustainability of peat of not, now seems like as good a time as any to explore some peat-free potting soil options.